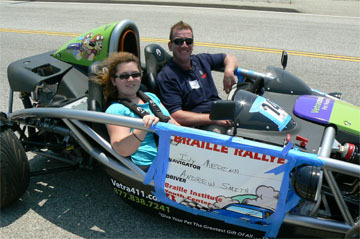 Thanks to the splendid forum at the Ariel Atom Owners Club I found out through a fellow owner about the Braille Rallye. This is a brilliant idea and day out that apparently began in 1965. Youngsters at the school who have varying degrees of sight challenges, from partially sighted to completely without sight become Navigators for a day for a staged Rallye. The idea is that it gives students an opportunity to practice their Braille skills and/or practice reading large type to give instructions to a driver to guide him or her on a fairly long Rallye that has checkpoints and is timed. The day began fairly early. I arrived at the Braille Institute at about 7AM and was among the first to get there. 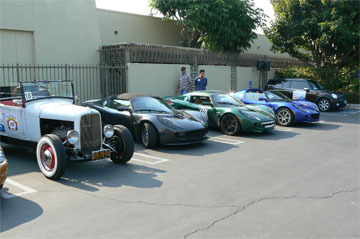 There was a great turnout from the Mini Owners Club and Smart Car Owners Club. There were some very cool vehicles there too, Lotus Elises, Alfa Romeo Spyders and the one that had me drooling was an Aston Martin DB9. As I mentioned, Dave from the Atom Club had let me know about the event so of course he was there too with his Atom. The principle was to receive instructions like “turn left First OPP” (turn left first opportunity), CAST 37 (Continue average speed 37MPH), etc. Basically following these instructions and using a timer to get to checkpoints and to the finish as accurately as possible in terms of time taken. It wasn’t about getting there quickly, but accurately. As I had never done anything like this before, I was actually a bit nervous as I didn’t want to get us stranded and completely lost! Fortunately, Ivy had done the Rallye the year before, so she was clued in to the abbreviations and descriptions. We did have an “if all else fails” bail out packet. Apparently, this contained instructions on how to get to the end point if completely without clue as to where you were. The Atom was a wee bit challenging in a couple of areas. First, sticking the signs on the side involved miles and miles of painters tape. Thank you to the person that let me blow through a whole roll! Also, the noise factor made communication “tricky”, especially on the freeways. The instructions first took us all the way down to Long Beach. They actually had us do a lap of the Grand Prix course. Unfortunately, we weren’t allowed to try “warp speed”. We toured around Long Beach, San Pedro, Laguna Niguel and ended up at Honda’s head office in Torrance for grub and refreshments. One of the instructions that was to head us back over a bridge to San Pedro was a little confusing. I was following a PD car, who was part of the Rallye. He must have thought like I did that we were heading the wrong way and tried a U-Turn over a meridian “hump”. Desperately unfortunately for the Officer, whilst the hump looked small from our side, it dropped off dramatically on the other and he completely beached the squad car. 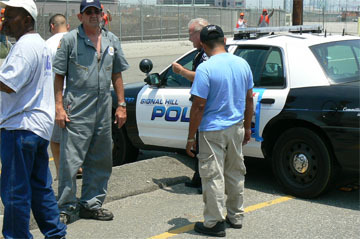 We tried manhandling it, even a semi-tractor tried pushing it, but unfortunately he ended up getting rescued by an LAPD tow truck. I’m sure they will all forget about that quickly and not give him any stick right? I’m delighted to say that Dave and his Navigator “Edge” won best in class in the other Atom! Great performance. Ivy won a “Good Samaritan” prize for trying to help the Officer and therefore messing up our time. As I said, it was not about “winning”, it was just a great day out with very cool students and the other drivers were great to meet too. Definitely looking forward to the Braille Rallye next year. 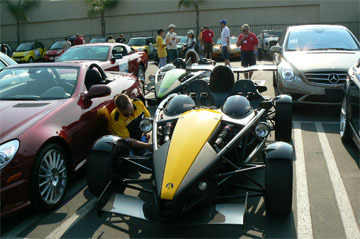 Click on the images below if you’d like to find out more about how I get paid to own an Ariel Atom.